Not too many places in the US see triple digit heat during the month of April, but our spot for warmest place in the country did it EIGHT TIMES! Sure, Needles sits in the California Mohave desert where one would expect to see heat extremes, but don’t let that dismiss my notion of just how darn hot it was here in April. 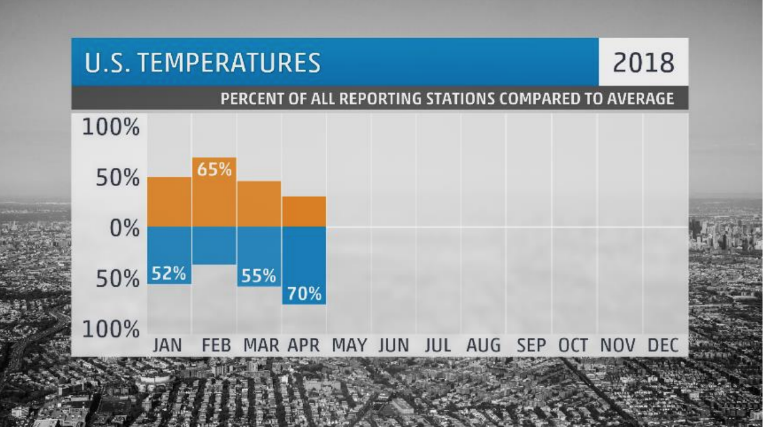 It was their warmest April on record at just over seven degrees above average. Twenty-four days of the month’s thirty days were above average with 12 clocking in at ten degrees above or better. The mercury climbed above 90 on twenty separate days; that’s the third most for any April on record. They hit the century mark or better on eight separate days; that’s the second most for any April on record. Five of their eight 100-degree days came back-to-back making for the 3rd earliest such stretch of triple digit high temperatures. Their first 100 of the month would be their third earliest 100-degree temp on record. It wasn’t just the days that were warm (the 3rd warmest high temperatures of any April), but the nights were remarkably warm. Low temperatures in Needles during the month of April were the warmest they have ever been in that month. As for records, Needles would break 4 daily high temperature records, including their 3rd warmest April day at 105 degrees. Four daily warm low temperatures would be set, including their 3rd warmest overnight April low at 76 degrees. Among all this heat, not a single drop of rain fell from the sky in April. I guess that’s desert heat for ya! 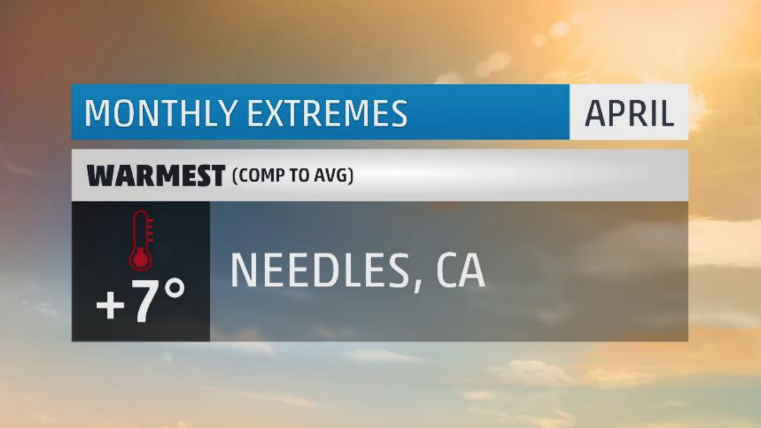 As for places that have seen triple-digit heat in April, only one spot has had more than Needles – Palm Springs, CA. In total, just 7 locations have made it to the century mark at least once. From the frying pan desert and into the nation’s heartland freezer we go for our next stop. Our coldest spot for the month of April spent quite a few mornings in the single digits and just as many afternoons wondering if the thermometer was broken and stuck below freezing. That spot would be Estherville, Iowa. 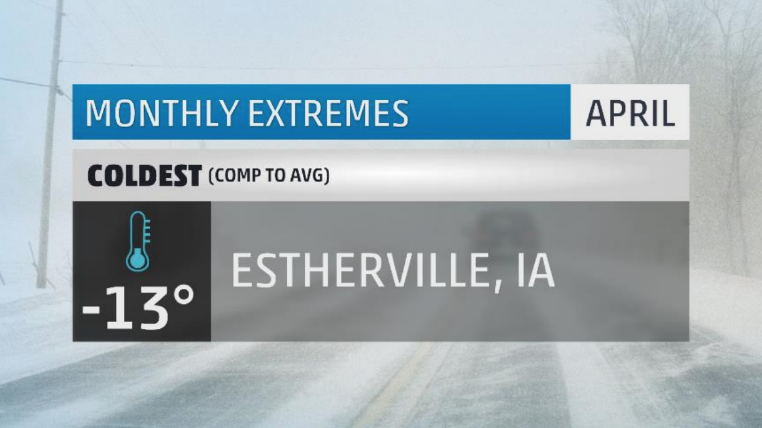 In April, the fine folks of Estherville would endure their coldest April on record. Twenty-eight days were below average with eight of them being at least twenty degrees below average. In a month where the average high climbs from 50 to 65 degrees by month’s end, the thermometer failed to reach 50 or better on 20 days and hung out below freezing for nine. Each of those is a record for number of days below those temperatures. The same can be said about overnight lows. In a month where overnight lows climb from 30 to 40 degrees on average, 19 nights stayed below 30 and another 3 were in the single digits. Both of those are record amounts. Their coldest night broke an April record at a frigid 4 degrees. In all, Estherville set 11 record lows and another 12 record cold high temperatures including their 2nd, 3rd, 4th, and 5th coldest high temperatures in the month of April. What a month it was for the eastern two-thirds of the country. A constant supply of cold air drawn directly from the Arctic kept the northern tier on ice and forced folks as far south as Georgia to keep out the winter coats. 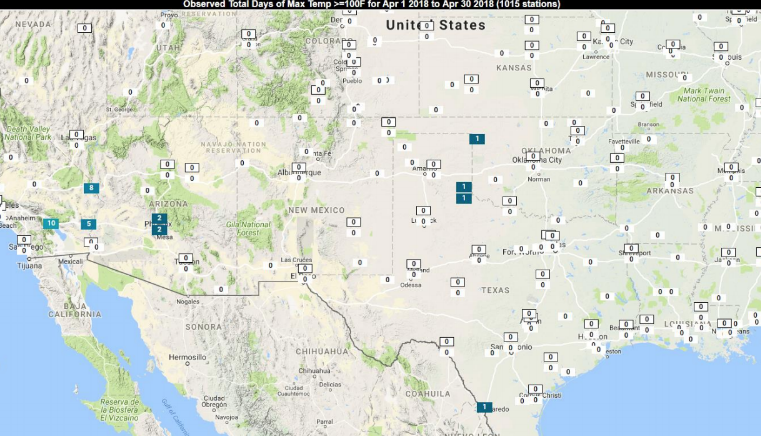 The map below shows locations where they experienced one of their top 10 warmest or coldest Aprils on record. Needless to say, the blue dots far outweigh the red dots. 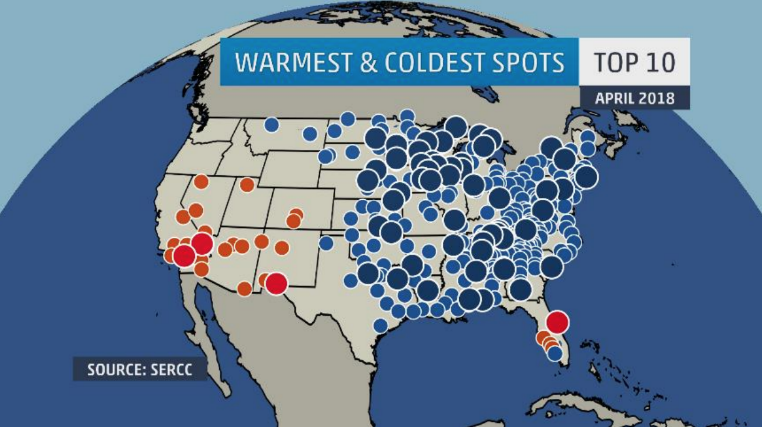 In fact, 285 cities had a top 10 coldest April. Roughly 70% of the nation ended April on the cold side of average. Our pick for wettest spot got on this list in a unique way. 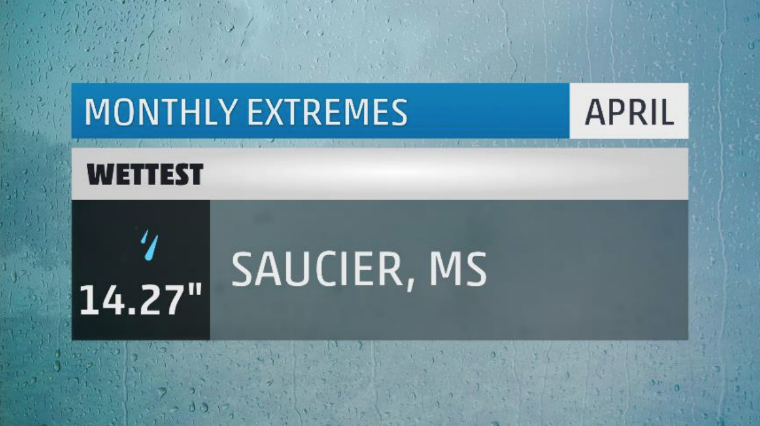 Saucier, Mississippi picked up an incredible 11.70 inches of rain in just one day! It would end up being their wettest April day as well as their second wettest calendar day on record. By the way, that’s second behind one incredible wet day caused by Hurricane Georges back in 1998. The cause of Saucier’s wet day this time around was not tropical in nature but instead a training line of severe thunderstorms which rocked the region, prompting tornado warnings and numerous flash flooding events. With just 15.98 inches of rain fallen year-to-date, they essentially picked up over 70% of their total rainfall in just one day. And really, it wasn’t even a full day’s worth of rain. The thunderstorms that came through the area lasted no longer than 5 or 6 hours. Talk about a gullywasher! Of the other 29 days in April, five had= measurable rainfall. This would make for Saucier’s 3rd wettest April on record. Believe it or not, even with this crazy rain event, Saucier is still almost six inches BELOW average for rainfall on the year. Yeah, they need more rain. 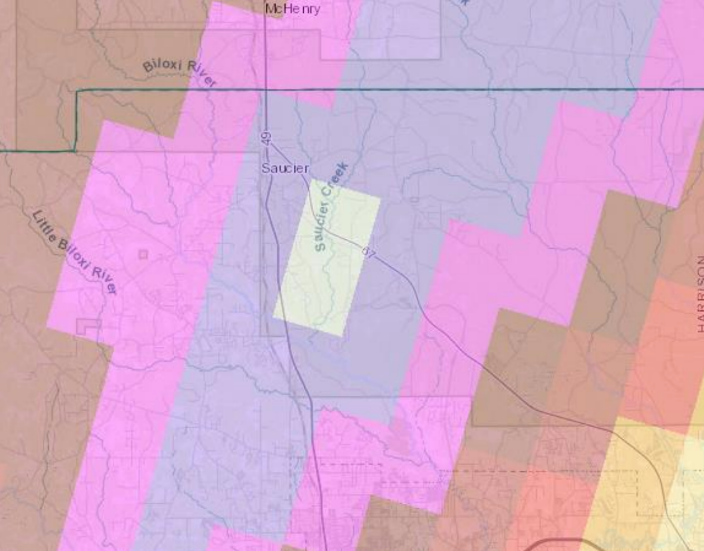 This image shows the radar estimated rainfall near the town of Sacuier on April 15th. 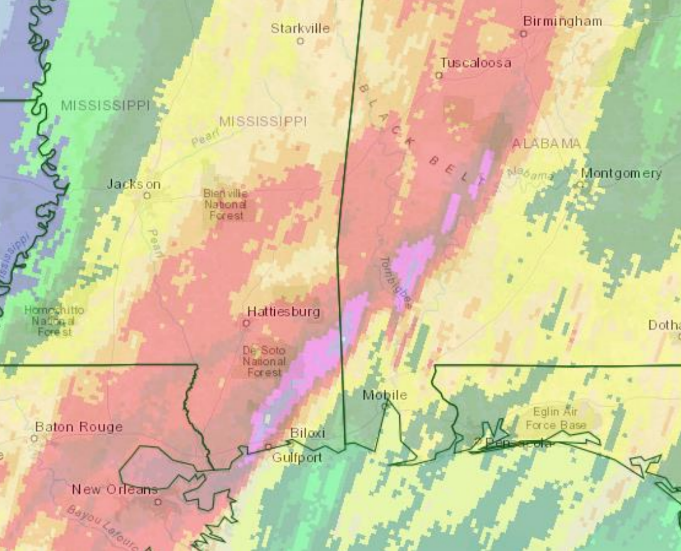 The white bullseye indicates rainfall over 10 inches. A broader looks shows the impressive area of training that took place, dropping at least five inches of rain in a line from coastal Mississippi up through Central Alabama. 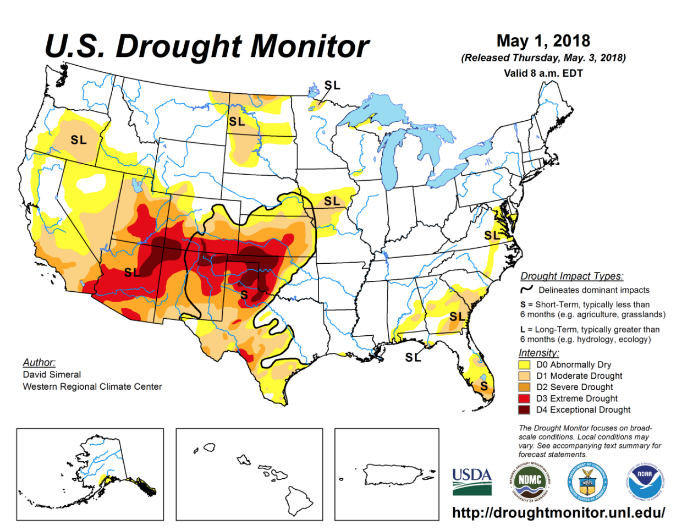 Elsewhere, continued exceptional dry weather remains in place over the desert Southwest and now stretching into the Great Plains. As expected, drought areas are also creeping further north in that region. 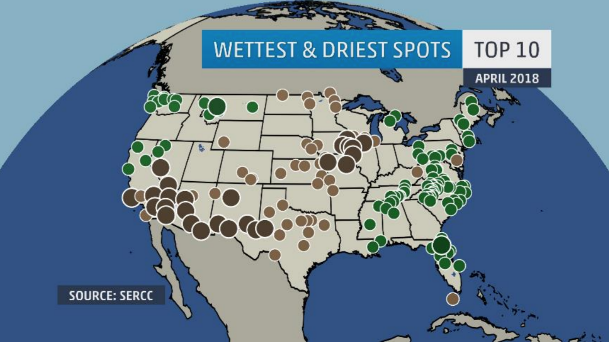 Some 80 locations would end up with a top 10 driest April on record. winter on record, places in and around the Great Lakes continue to set records even into spring. Our snowiest place in the US this month happens to be just there. 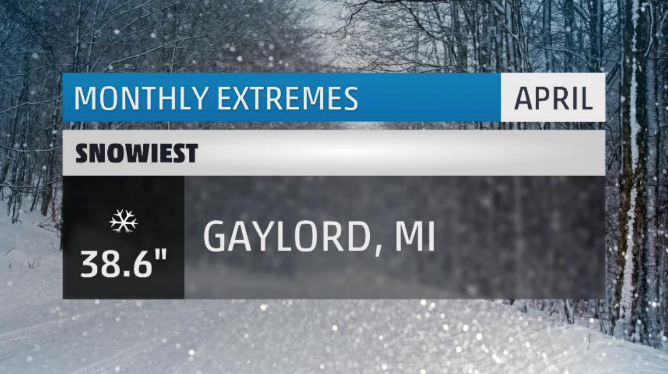 Gaylord, MI picked up almost 40 inches of snow in April making for their snowiest April on record. The bulk of their snowfall came from two potent winter storms. This first, Winter Storm Wilbur, dropped a little over a foot of snow in Gaylord to kick off the month. Wilbur would be Gaylord’s 5th largest April snowstorm on record. A few weeks later, Winter Storm Xanto would drop an impressive 21.7 inches of snow, making it their largest April snowstorm. Over ten inches of snow would fall in one day during Xanto which would end up being the 2nd snowiest April day on record (just missing the number one spot by 0.1 inches). Six daily snowfall records would be broken in April and lead to a snow surplus for the month of over thirty inches. To all those birds who tried to fly back north this spring, sorry! 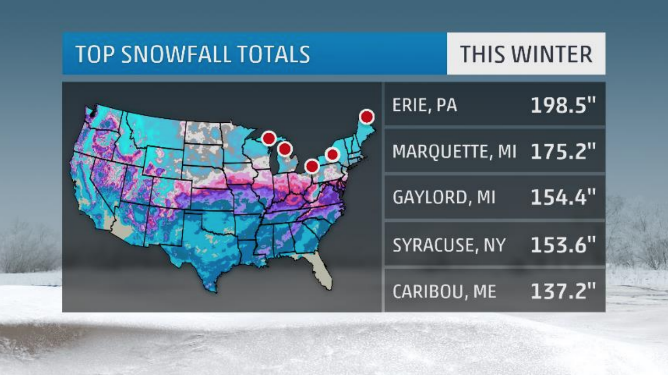 Not to mention, Gaylord is also one of the snowiest metros in the US this winter season. From their first snowflake through the end of April, they’ve picked up over 150 inches of snow. That’s enough to be their 8th snowiest winter on record. We head back to the southwest to find our sunniest place in the US this April: Alamogordo, NM. 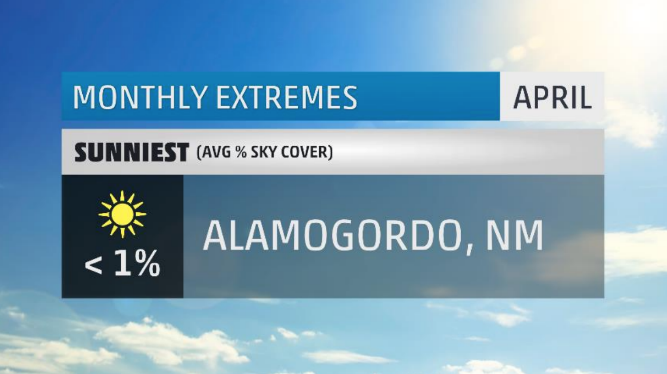 Alamogordo was sunny on all 30 days of the month. Technically, 29 of those days were 100% clear while one day had roughly ten percent total sky coverage. Not only was it incredibly sunny, but it was also incredibly dry. The average relative humidity for the entire month was a mouth-parching 20%. The reporting sensor did pick up on a thunderstorm in the area on one day, but there was no rainfall to be found. Dry lightning is often a common occurrence in the desert and is one of the leading causes in wildfire genesis out west. With all the sunshine, Alamogordo reached their 3rd warmest April on record. On average, their sunniest time of the year is right now, so there’s that. Our last stop takes us into the northeast where a persistent stormy and cool pattern was all that was on the books for April. 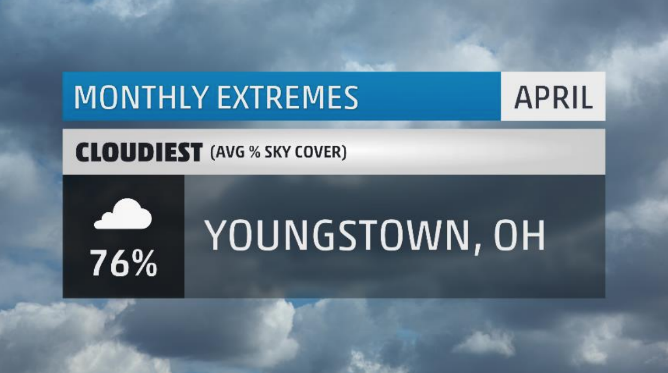 The cloudiest of spots was Youngstown, Ohio, which spent a lot of the month under gray skies. Twenty-eight days were no better than partly sunny including 19 mostly cloudy days and 9 completely overcast days. On top of that, there was rainfall on 24 of those days, making for a damp, dreary, cold, and miserable month to make it through. On average, Youngstown comes in at 30th on the list of cloudiest US cities. The good news is that Youngstown’s cloudiest stretch typically ends in May, so, perhaps those gray skies will clear up soon. Time will tell. There you have it, the extremes for the month that was April 2018. Make sure to check back next month to see what May has in store! What weather extremes did you face in April where you live? Let me know in the comments below.